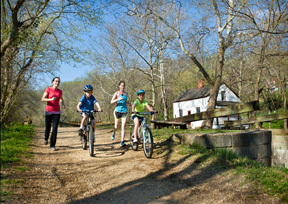 Show Your Love for the C&O Canal: Create Your Own Fundraiser! So build your own fundraising page, bring attention to the C&O Canal with your pursuits, and help generate financial support to keep the Canal going strong! It’s really easy (and free!) to create. Here’s how to do it. Click the Get Started Button to Register and Create your page. If your fundraising idea includes other people’s participation (other than your donors), select Create a Team Page. If the fundraising idea only includes you, or is a memoriam page, select Create an Individual Page. Add your own copy and pictures/videos, and then ask your friends and family to support your fundraiser by sharing your page and requesting donations. You can use email, Facebook, Linkedin, & Instagram to let people know what the Canal means to you. Need some help? Download our Fundraising 101 Toolkit! What kind of fundraising pages work? Do you regularly hike, bike, run, or kayak the canal? In lieu of gifts, donate your birthday and ask friends and families to support the Canal by giving via your personal fundraising page. If you’re having a party, let everyone know! Are you celebrating a life event or memorializing a loved one? Bar mitzvahs, weddings & graduations often inspire community service. Use your personal fundraising page to help preserve the amazing history and the environment that exists right along the Potomac. If the C&O Canal held a place in the heart of a loved one you’d like to honor or memorialize, build a memorial page to celebrate their life and love of the canal. Don’t forget to include pictures and videos! If the towpath helps you train for your big run, return the favor by raising money to keep the towpath healthy and maintained with your own fundraising page.